Screenkicker Meets…. 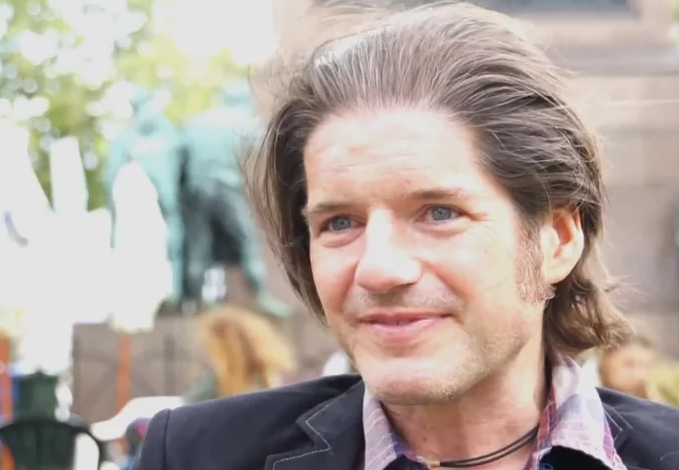 The Walking Dead Co-creator Charlie Adlard – Screenkicker! Me: Hi Charlie, nice to meet you, you’re here at the festival talk about your book ‘White Death’. 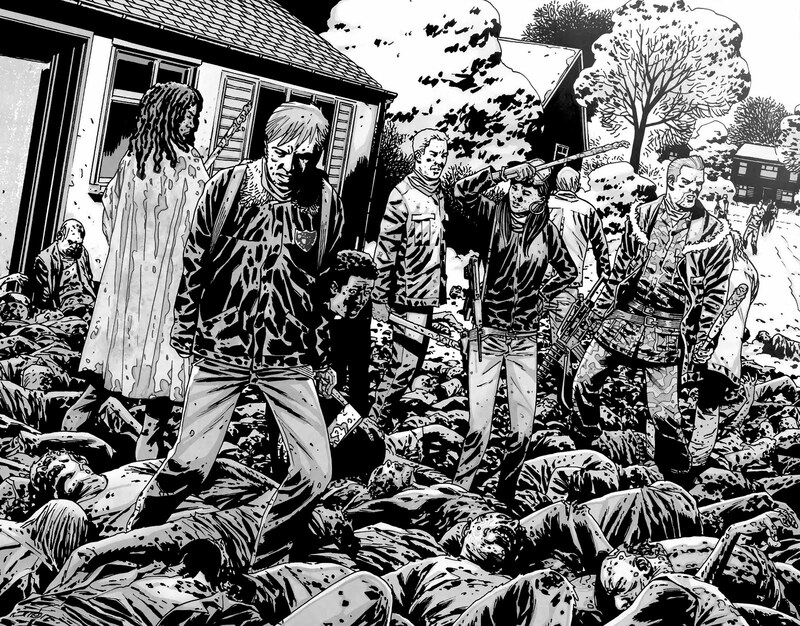 Charlie Adlard: Yes, White Death and Walking Dead. I only do books now that have the initials ‘WD’! CA: Yes, its set on the Italian Front up in the Trentino mountains. CA: We wanted to approach it from a different angle. How many times have you seen, whether its books, films, comics, whatever, the cliche that war is hell? It’s all very honourable but you kind of think there must be another original approach so Robbie (Morrison – White Death co-creator) came up with the concept of the avalanches. Visually its not something you see often, especially World War One, its a very untapped resource. Me: When you watch The Walking Dead, do you ever see characters and think ‘I didn’t draw them like that’? CA: No, no, it’s actually the opposite. I’m not naive, I didn’t think that when Andrew Lincoln was cast as Rick ‘this looks nothing like Rick’. I just though as long as he plays Rick that’s fine. I had a few issues with certain characters only because they were not portrayed as we’d written them but I trusted Robert (Kirkman) because obviously he’s deeply involved with the show. For instance Andrea was almost completely the opposite of how we portrayed her in the book. She came into the show as a very strong character right from the get go. She was much older so you think ‘is this really Andrea only by name?’. Ironically she wasn’t popular with the TV viewers, I don’t think anyone was particularly upset to see her killed off in the show. (Laughs) The long answer to your question is it really doesn’t bother me in terms of who they cast so long as they’re inherently true to the character. Me: Do you ever get bored of drawing different ways for people to get eaten? CA: (Laughs) Actually, its the most boring part of the book! Especially trying to come up with how many ways can you kill a zombie, where you can only kill them in the head, you’re kind of limited in that you can’t go too crazy. You want to portray it as realistic as possible so you don’t want to go all out superheroics or anything like that. So you’re boxed in a bit in terms of the action. Its no secret, I’ve said it before, for me zombies are the most boring part of the job! Me: You also worked on Judge Dredd comics too. How was that? CA: I originally worked with Alan Grant on Dredd and then I worked with Dave Stone a lot on Judge Armitage who was the British version of Dredd. Me: What was his character like? 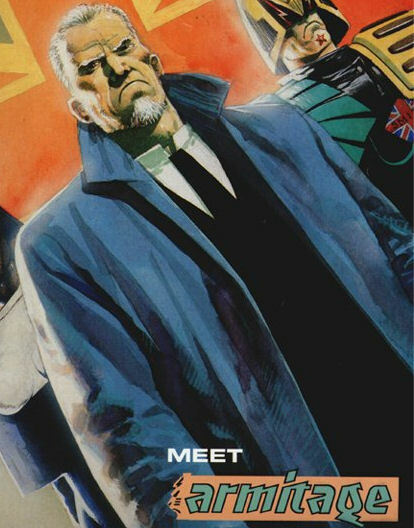 Was he an extremely polite version of Dredd? CA: He was more of a detective and based in Brit City One. The design (of the British Judges) was really good, they had more pointed helmets like classic police but with a British lion where the eagle was on the American Judges. So Armitage was just a guy walking around in a trench-coat (laughs). Me: You’re here in Edinburgh for the book festival. Do you remember a time when comics weren’t featured at these kinds of events? CA: I’ve read a lot recently of people saying comics are getting a new respect. 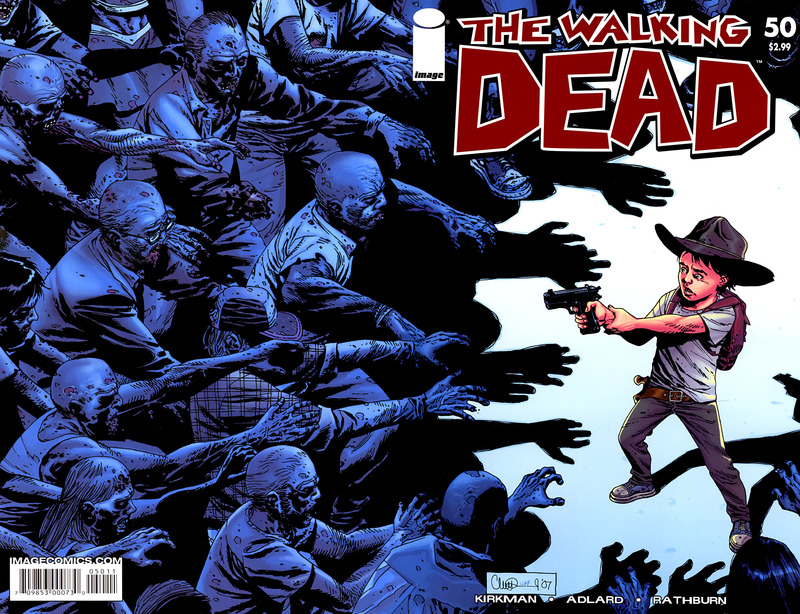 I don’t know if its translating to sales so much but The Walking Dead is a big anomaly but that’s more because of the franchise rather than the book itself. I’m more than happy to be part of a growing interest in comics and I’d like to think personally taht people are now seeing comic books as more than just superheroes. Even in America I’m sensing a small sea-change in the dominance of superheroes which unfortunately holds sway over here as well. Image Comics have had a lot to do with that, in the last ten years they’ve been pumping out good material that’s outside of superheroes and is selling which is really encouraging. Comics like East Of West and Lazarus by Gregg Rucka which is great. It’s an exciting time to be drawing comics. How could you not love drawing this kind of carnage?! Me: The Walking Dead TV show is amazingly popular. Are you limited in how crazy you can go with the things you draw? CA: I don’t think that’s an issue with the TV show. There are going to be certain elements that i’m going to be interested in seeing how they achieve it like when they get to Washington DC. Me: Or when they go to space? CA: (Laughs) Of course that bit! I think that’s issue 150! When they get to Washington DC it isn’t in the countryside which costs a lot more money to film. Also I don’t know how they’re going to do Negan, if they do Negan. I will be amazed if they get away with the man’s potty mouth for starters but that’s so inherent to his character in the book so it’s going to be interesting to see the limitations they’re going to have to put on themselves. Personally when I’m drawing the books I never think of the TV show at all because we are pretty much dictating the way the television show goes and not the other way round. It’s quite exciting sitting in my little studio in Shrewsbury beavering away thinking you’re sort of controlling this! He wasn’t lying about Negan’s mouth! Me: Or you could mess with their budget by drawing a new character that looks just like Scarlett Johannson?! CA: (Laughs) I’m sure she would do it! Me: I think they blew all their budget on the tank in the first episode! CA: They actually closed off four city blocks in Atlanta to film that. I walked on it and thought ‘this is just like being on a major hollywood studio set because of the size and scope of the thing. Me: It must be like walking around in your own mind! CA: When I went on the set of season 3 when Robert persuaded me to come see the prison I was looking at the little things like they’d designed the guard towers exactly like the way I’d drawn them. They didn’t have to do that. They even designed the dinner tables in the prison exactly like I drew them! Me: Just one more thing – did you watch the latest Dredd movie? Did you like it? CA: I did very much. Me: Do you have any sway over a potential sequel? Please say yes! CA: Oh God no! I’m just one of the many, many, artists and writers that worked on Judge Dredd. A funny story is Andrew McDonald, and Alex Garland went to visit John (Wagner, Judge Dredd creator) in Shrewsbury and they all went out for a meal to this restaurant called The Peach Tree, and of course they named the city block in the last Dredd movie Peach Trees. I haven’t got any say but I was impressed, unfortuneatly it didn’t do well enough at the box-office. As far as I heard they had a plan to do it as at least a trilogy, with the idea being to do The Cursed Earth and then to do the Dark Judges in the third one. I was more upset that Dredd wasn’t given the chance to open it’s world up. Me: Thanks again for talking to me and I’m looking forward to see where you go next with the comics. 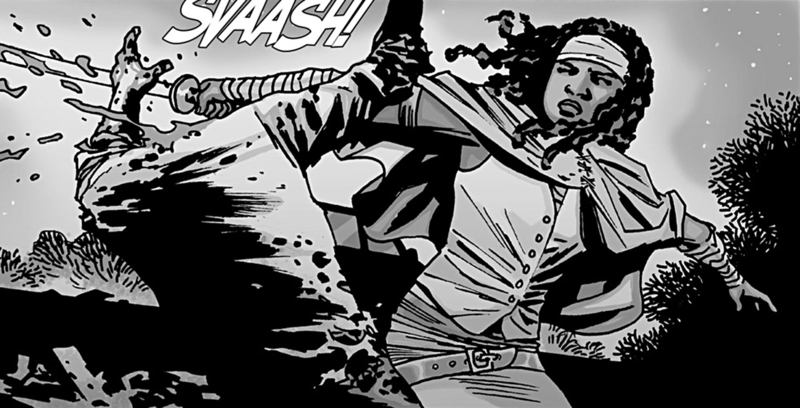 You can check out White Death and The Walking Dead at the Image Comics website. Thanks again to Charlie for being a lovely guy and a really interesting interviewee. And is there an audio/one of those snazzy recordings of this? I do have audio but the sound quality isn’t great. Was quite a windy day! Great job Mikey, seems like a cool guy! Yeah he was super cool. And really friendly. Ahh this was so awesome! He seems like such a nice guy, and good for you for getting him to laugh a couple of times! Thought what he said about Andrea was funny. She was a decent character in the comics but in the TV show she was absolutely insufferable!